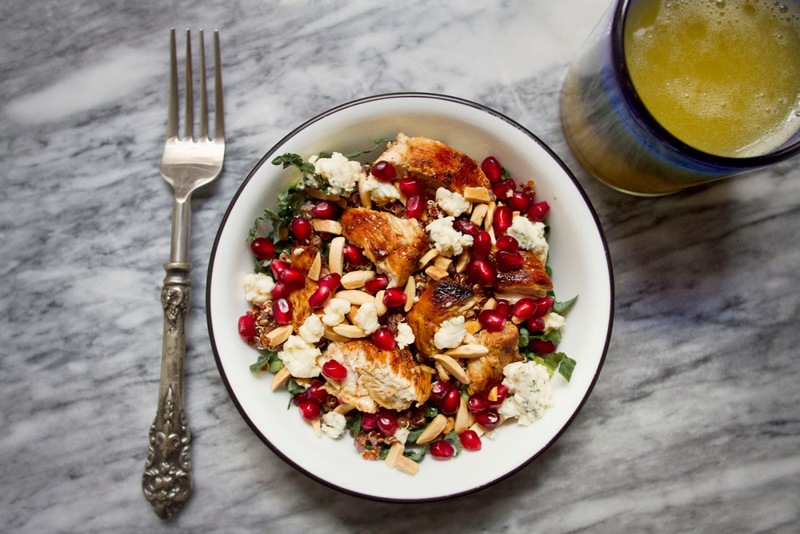 Little Market Kitchen: Kale and Quinoa Chicken Pomegranate Salad with Maple-Balsamic Dressing. 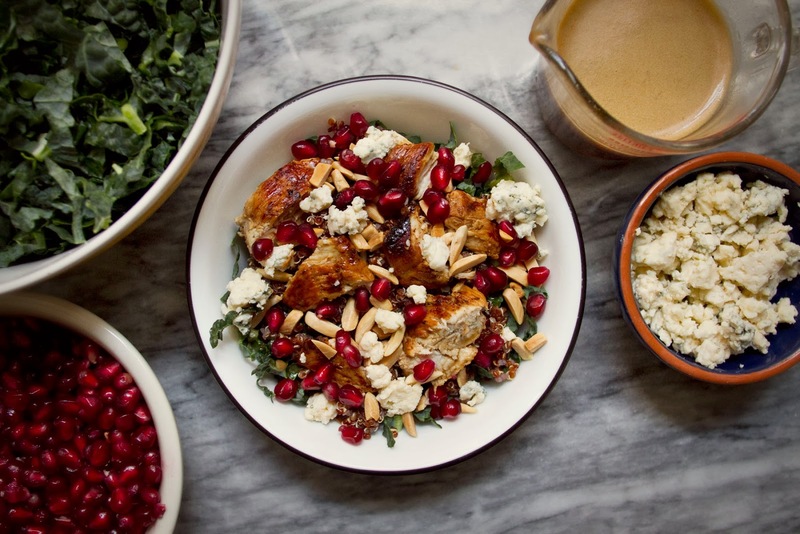 Kale and Quinoa Chicken Pomegranate Salad with Maple-Balsamic Dressing. I live in the Chinatown neighborhood of Manhattan, which isn't just a cute name. When I walk down my block I pass two buddhist temples for whom the burning of offerings on the Manhattan sidewalk is not an uncommon occurrence, I don't bat an eye at the fish, plucked fresh from the East River, dangling, drying, mouths open, from my neighbors fire escapes. I eat at takeout places under the Manhattan bridge where the only english spoken is the number system I use to order my hot oil noodles, and I know why the shop keepers wear second sets of sleeves pulled up over their arms (to protect their shirt, of course), what those "Million Dollar Bill" notes in the dollar store are (offerings, to be burnt), I know a traditional funeral procession when I hear one coming down the block, and I can identify the smell of Durian a 50 feet away (it smells delicious, I don't know what everyone complains about). The open air fruit markets in my neighborhood sell rambutan, dragon fruit, candied lychees, lotus root, bitter melon, carrots 18 inches long, 4 ft tall sections of sugar cane, giant jackfruits, and of course, pomegranates. It's almost hard to believe once upon a time a pomegranate was exotic to me, unique, special. Now they're one of the most identifiable and western seeming fruits at my market. When I was a child I loved greek mythology, and the myth of Hades and Persephone fascinated me. 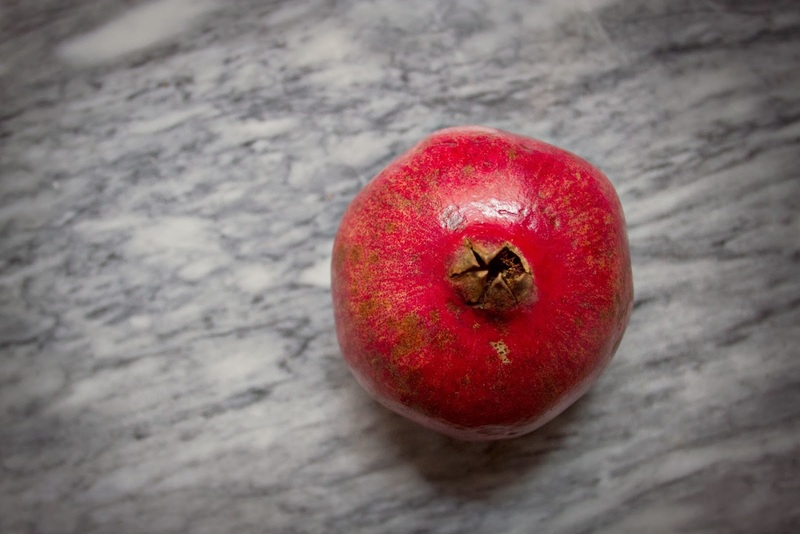 Kidnapping, attempted wooing, a pomegranate aril eaten in Hades, the creation of winter. It was all very dark and scary, and yet I remember finding it kind of weirdly romantic. Apparently my juvenile brain thought tricking someone into spending a third of each year with you was romantic. When I was young, my mother would allow me to pick out a piece of exotic fruit at the grocery store, if it wasn't too expensive. We tried pomelo, starfruit, ugly fruit, champagne mangoes (SO GOOD), coconuts, and of course, pomegranates. 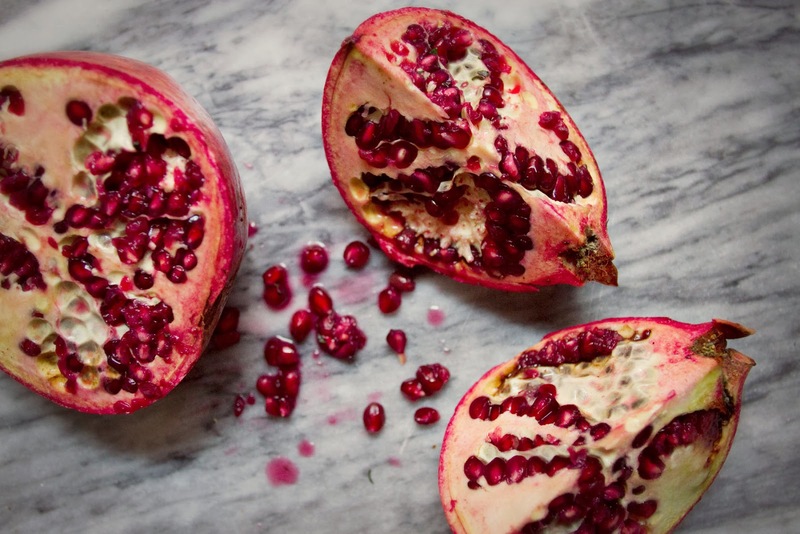 Pomegranates were one of my favorite fancy fruits. I would cut them into quarters and eat one quarter a night, my little kid fingers deftly picking through all the membranes and flesh to get to the delicious little jewel seeds. Now, all the fruits that once seemed so exotic to me are more likely to be sold in the nearby fruit market than apples or bananas are (though there are always oranges, regardless of season). Sometimes I stand on Forsyth, under the Manhattan bridge, across from a mechanic with "Moter Shop" painted on the wall, inhaling the pungent-slightly-rotten-very-sweet smell of the durians, picking through a bin of sugar plums or longan berries, wondering how I could be so lucky to live in a place like this. 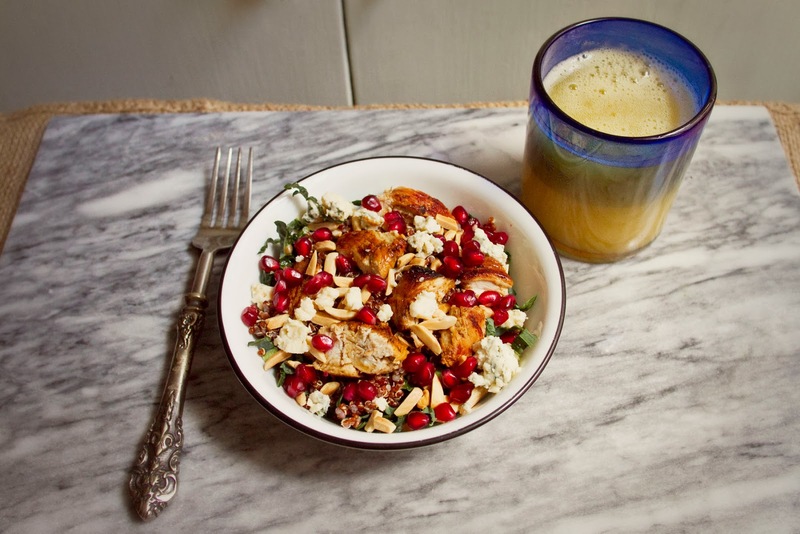 Pomegranates make a fantastic pairing with kale, which they absolutely do not sell in my neighborhood. There's also no quinoa, of course. Some things I have to head to SoHo or Tribeca for. 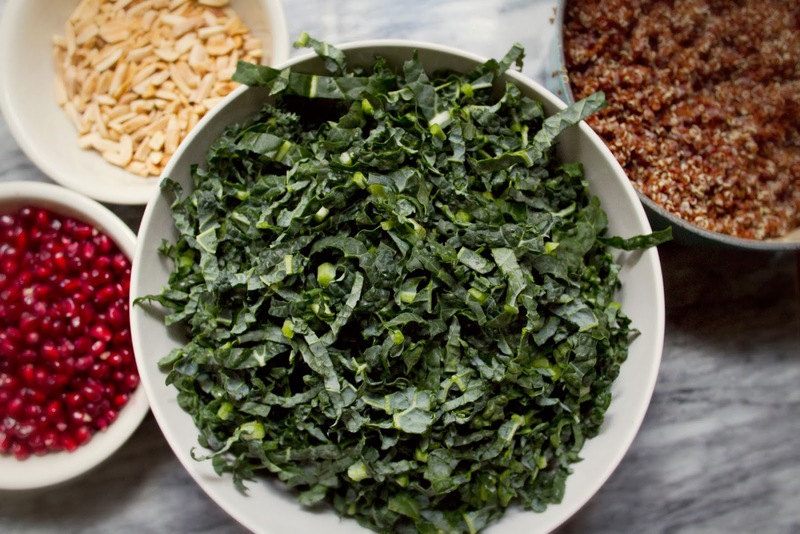 The sweet, slightly earthy taste of the pomegranates compliments the green, earthy kale, and the toasted almonds are downright luxurious alongside the formidable greens. The balsamic vinaigrette is probably my favorite, go-to dressing. It's simple, tangy, and a little bit sweet. I had always emulsified my salad dressings by hand, until recently when S suggested I try the immersion blender while whisking up a caesar dressing, and it worked so beautifully, I've been blending all my dressings this way ever since. In this recipe, an immersion blender will leave you with a pale brown, creamy dressing so tangy and sweet and delightful you'll want to triple the batch and pour it on all the lettuce in your house. You'll want to dip lettuce in it and eat the leaves like tortilla chips in salsa. I made this salad in the afternoon, and devoured it for lunch alongside a homemade ginger orangina, and then when S came home from work we ate the rest of it out of our giant, stainless steel dinner salad bowls. It was so tasty not one shred of kale, bite of chicken, or crumble of blue cheese was left in our bowls. Enjoy! Makes two dinner sized salads with a bit leftover for lunch. Begin by marinading the chicken, in a large ziploc bag or shallow pan combine 2 tbsp olive oil, 1/4 C balsamic vinegar, the juice of 1/2 a lemon (about 2 tbsp), and a generous sprinkling of salt and pepper. Mix well, then add the chicken breast, cover (or seal bag), and set aside for at least 30 minutes, but you could even do this in the morning before work, by dinner the chicken will be extra marinaded. Toast the almonds by placing them in a small skillet and heating over low heat. 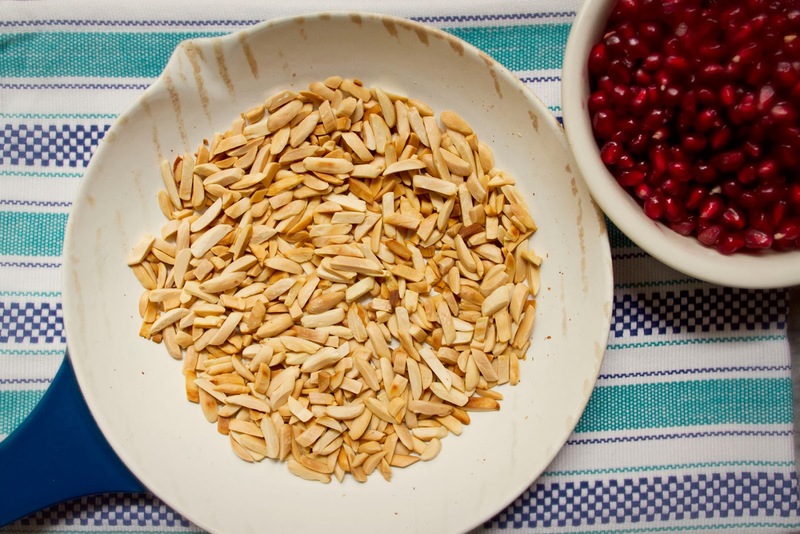 Mix the almonds around, keep them moving most of the time to prevent burning. They will slowly turn pale tan and creamy colored, and then light golden brown and toasty, remove from heat once they look and smell toasted. Careful not to burn them, it's easy to forget and burn one side of every almond. When they'e toasted, after about 6 minutes over heat, pour the almonds into a small bowl and set aside. Rinse the quinoa in a fine mesh steamer, then place in a saucepan along with 2 cups of water, turn heat to medium and bring water to a boil, then give it a stir, reduce to low heat, and cover. Cook for about 12 minutes, or until quinoa has puffed, sprouted, and absorbed most of the water. I like to stop before the quinoa gets too soft, so it will hold its shape better in the salad. 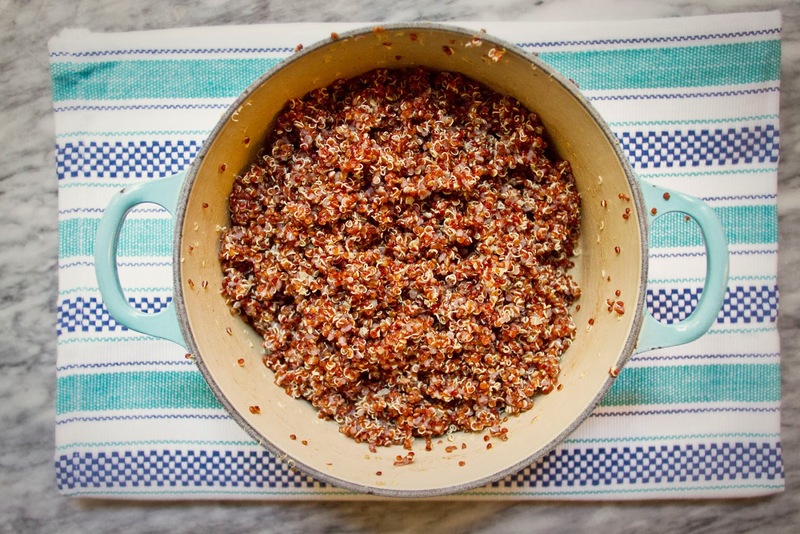 Drain any excess water and fluff quinoa with a fork. Set aside. 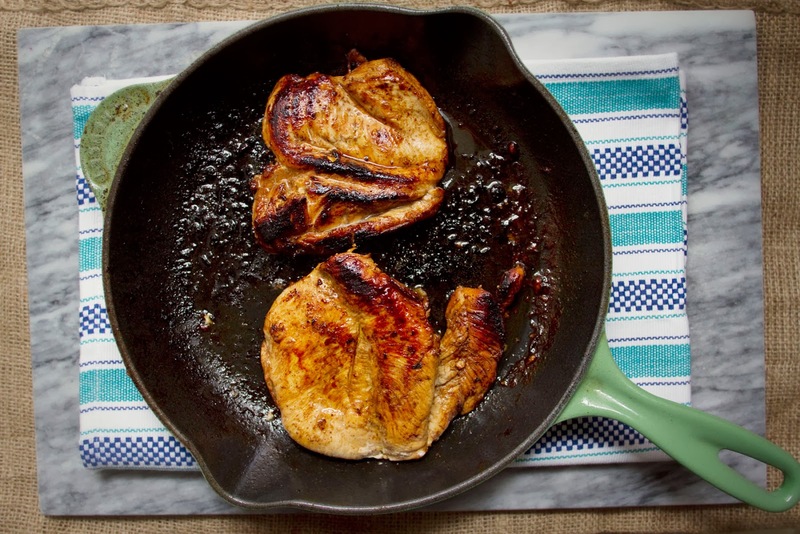 When the chicken is done marinading, pour a bit of olive oil into a heavy bottomed skillet, place over medium heat and once pan is hot, add the chicken, move it around bit to get an olive oil coating so it won't stick. Add a few tablespoon's of the marinade mix in with the chicken, and cook for a few moments then flip, to brown each side. Reduce heat slightly, cover chicken and let cook another ten minutes, or until juices run clear (cooking length will depend on chicken thickness). While the chicken cooks, start on the kale. If you find kale a bit bitter, give it a massage (seriously! ), take the leaves in your hands and rub them together until the leaves darken and become softer. I don't mind the strength of kale's taste, or its consistency so I usually don't bother with this, but if you're at all apprehensive about kale I recommend it. It really does change the consistency and lighten the taste of the kale. To slice the kale thin, stack 4-6 kale leaves together, then roll them into a long kale cigar. Begin slicing at the leafy end, and cut across the cigar in thin strips. 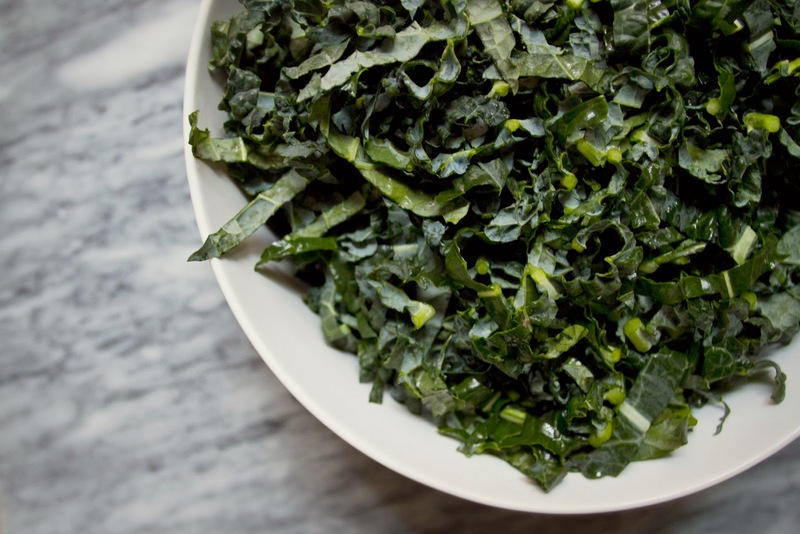 You'll end up with a bunch of skinny, couple-inch-long kale ribbons. Perfect! 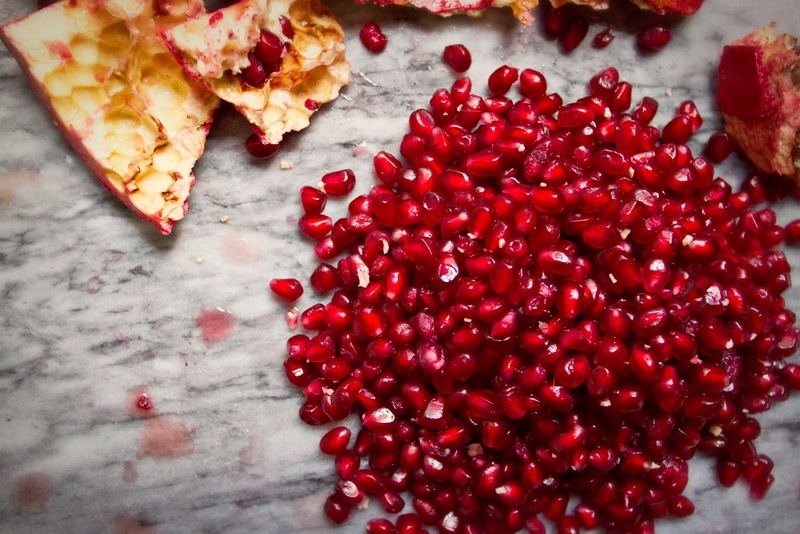 Now, remove the pomegranate arils. There's a great simple way to do this in a bowl of water. Or you can just hack it in half and make a big mess pulling them out with your fingers and eating a bunch as you go. This is my preferred method. Set them aside. When the chicken is done cooking, remove it from heat, and set aside on a plate to a cool a bit. Then slice into thin, bite sized strips. For the dressing, combine balsamic vinegar and lemon in a bowl, whisk well. Add maple syrup and whisk again, then slowly, beginning with just a few drops, add the olive oil while whisking like crazy. Continue adding olive oil in a very thin stream while whisking nonstop. The goal here is to emulsify the olive oil into the dressing so they won't separate. You can also you an immersion blender, which are pretty amazing for salad dressing making. 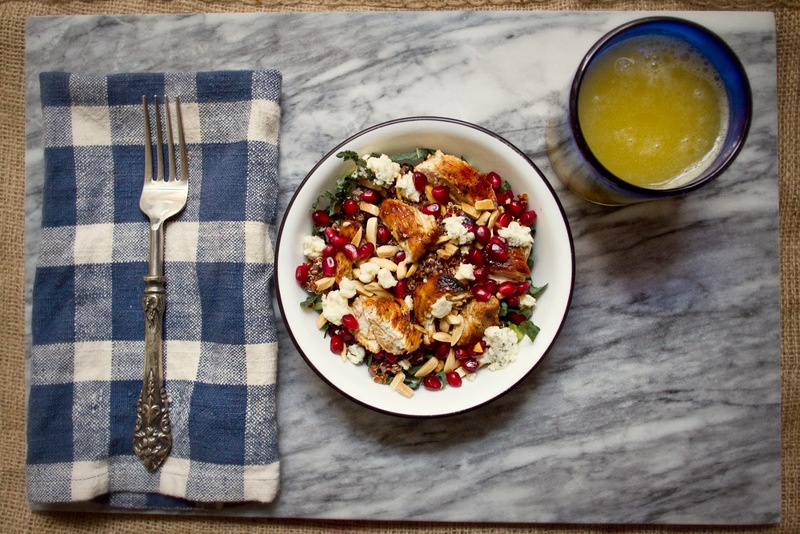 In large dinner bowls, place a healthy handful of kale, sprinkle it all over generously with quinoa, toss on some pomegranate arils, drizzle with dressing, toss a bit, then add some chicken, blue cheese, and almonds. Add another drizzle of dressing and devour.